It's the last of day of our week-long collaboration with The Cut Shoppe, an Etsy store which sells a variety of cut files (in SVG/PNG format) for use with electronic die cut machines. 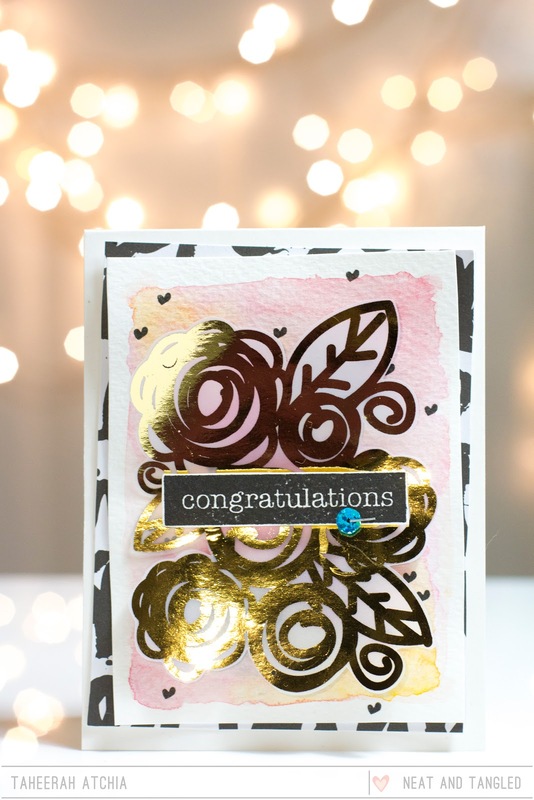 Ashley's cut files are gorgeous and go so well with Neat & Tangled stamps. I used Funky Florals and cut a variety of flowers, focusing predominantly on the more solid images. Next, I pressed some Distress Inks onto my acyclic block, spritzed with water and smooshed the die cut shapes into the ink to create a faux watercolor look. 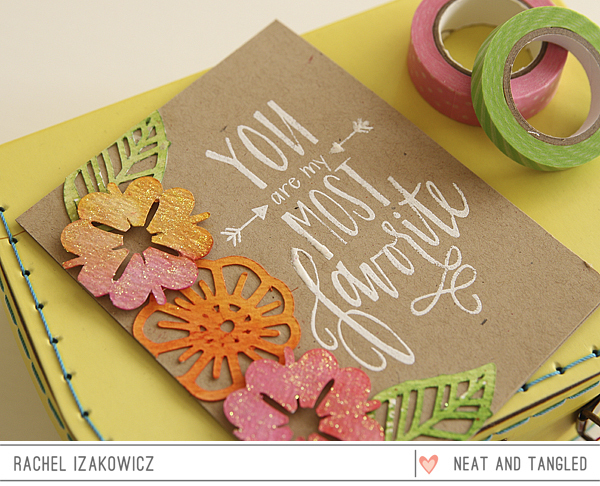 I stamped the My Favorite sentiment on the right side of the card and heat embossed it in white. I arranged the flowers and leaves along the left side, giving the solid flowers a good coating of glitter. 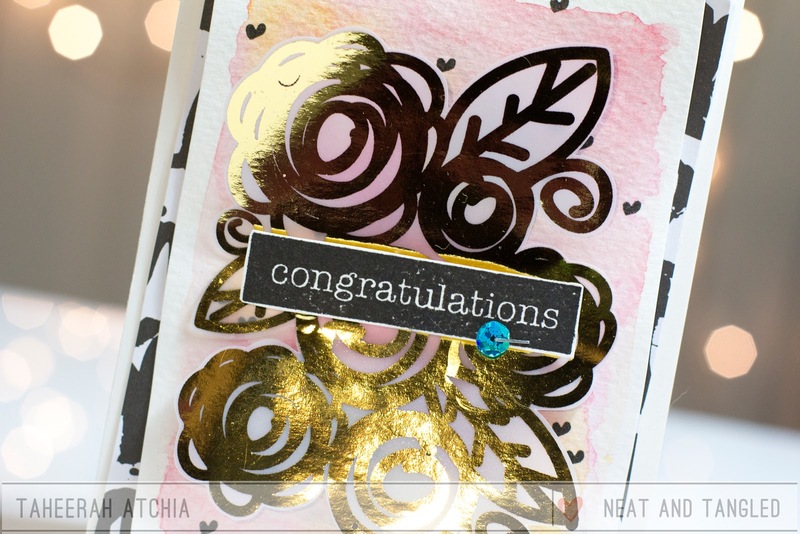 I used the Rosey Posey cut file and printed and foiled it on vellum using my Minc. This was fussy cut and layered over a watercolored panel that I randomly stamped using the tiny heart from Gifts For You. 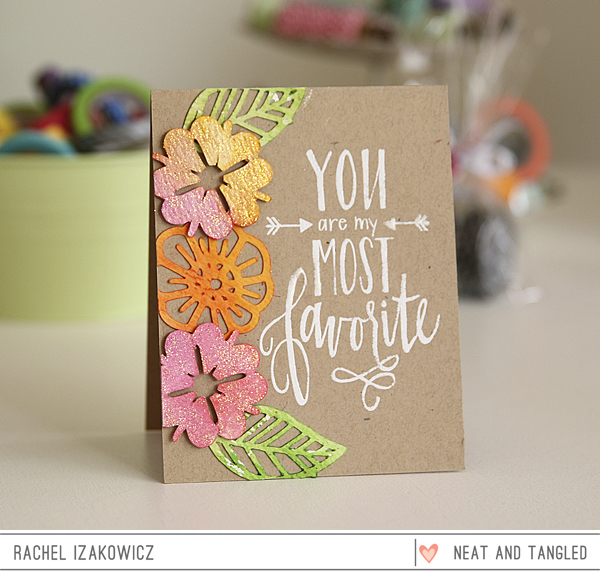 The sentiment is from Everyday Labels, and for a bit of color and contrast I added a Birthday Bash sequin. What a great week it has been! We have so enjoyed working with The Cut Shoppe's files. Don't forget to head over to their blog and leave comments on all the hop posts this week. We'll be drawing a winner over the weekend! That foil job is AWESOME! I love this stamp! is so beautiful and the flowers are awesome, I love this card! The flowers are so pretty. they look like wood pieces that have been colored. Taheerah's card is wonderful too. I haven't done much with foil yet but it's next on my list of things to master. thanks for having the hop and teaming with the Cut Shoppe. Beautiful Cards Ladies!! LOVED the Inspiration shared All Week!! Have a Fabulous Weekend!! Wow! Both cards are absolutely gorgeous!! Both of these floral cards are fantastic! Wow these cards are gorgrous!!! Love the watercolor flowers and that gold roses just WoW!!!! So beautiful! I love all of the technique ideas! These are AWESOME! I'm so in love with how awesome these cards are! !